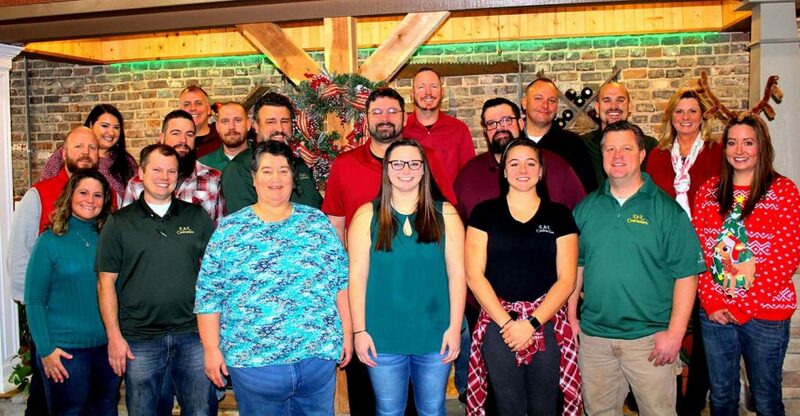 Decorating your home for the Christmas holidays is a great way to join in on the holiday festivities, but stringing lights and Christmas decor can also pose a risk of damage to your property if you don’t know what you are doing. You can avoid unnecessary risks by following a few simple tips for keeping your home safe as you decorate it for Christmas. Bare or broken wires do more than keep your lights from working. They can pose a danger of fire or injury when the electricity is turned on. 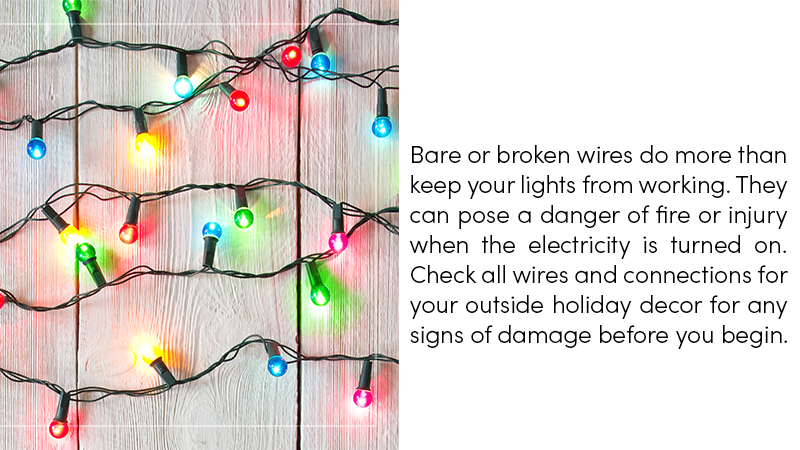 Check all wires and connections for your outside holiday decor for any signs of damage before you begin. Using ladders or climbing on the roof can be dangerous in the winter, especially when the surfaces are covered with snow and ice. Always check surfaces for ice before you begin. Although it might seem warm outside, your roof or walkway could be covered with a thin coat of ice from the night before. 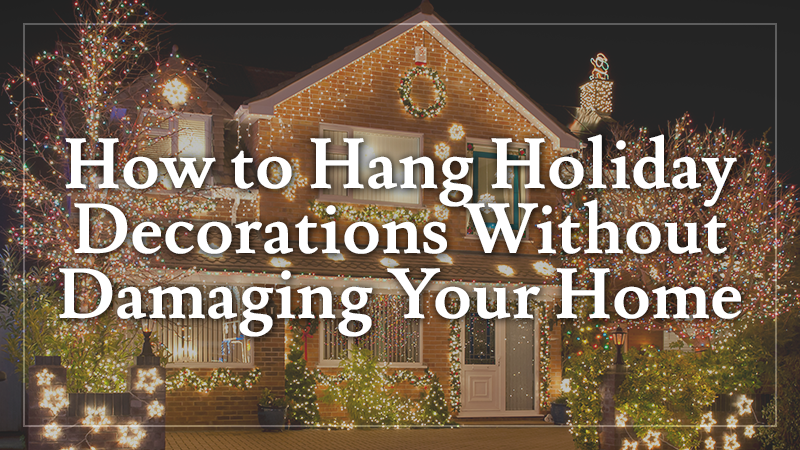 Choose a time when surfaces are free of ice and snow to begin hanging your holiday decorations. Hammering in a few nails to support Christmas decorations may seem harmless, but nails can leave holes in the roof or siding that will let in moisture. You can buy special clips to use for hanging lights and other decorative items in the holiday aisle. These clips can be reversed for use on both the shingles on your roof or on your siding. Always observe the weight limit on the clips and use them as directed. While many clips advertise that they are safe to use on your gutters, use common sense and don’t overload your gutters with weight. The last thing you need is broken or loose gutters that can’t do their job. 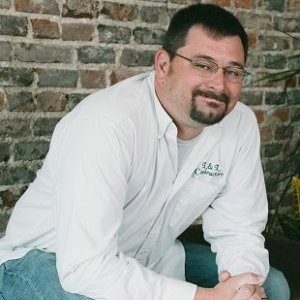 Likewise, avoid running wires or locating connections in the gutter as this may cause a problem if your gutters fill with water. If you are adding blow-up or plastic decor to the top of your roof, beware of the chimney and place items far enough away to avoid possible contact. Keep in mind that winds and storms may blow the items a considerable distance. Contact with the chimney could send your decorations up in flames and can pose a risk of a house fire. When the holiday season is over, it may be tempting to give those lights a pull and remove them quickly, but this isn’t recommended. You could ruin the lights or damage your roof or siding in the process. Take your time and remove them carefully. If you aren’t sure how to attach holiday lights or other ornaments safely to your siding or roofing, we’d be glad to offer you advice. Contact us today to discuss your holiday visions or any other home update ideas!